The Red Sox scored three times in the eighth inning and three more times in the tenth to beat the Toronto Blue Jays 9-8 at Fenway Park on Friday night. Following the disturbing breakdown against the Yankees on Thursday in which Koji Uehara served up two solo home runs in the ninth inning, the two late rallies were especially surprising. The game see-sawed back and forth from the start. Toronto took an early 2-0 lead in the top of the first; the Red Sox tied the game with single runs in the first and second on an RBI single by Yoenis Cespedes (pictured) and a sacrifice fly by Christian Vazquez. Mike Napoli's ground out in the third gave the Sox a brief 3-2 lead before the Blue Jays scored a pair of runs in the sixth and eighth innings to take a 6-3 lead. Boston tied the game in the eighth on an RBI single by Mookie Betts and a two-RBI double by Xander Bogaerts, one of his three hits on the night. 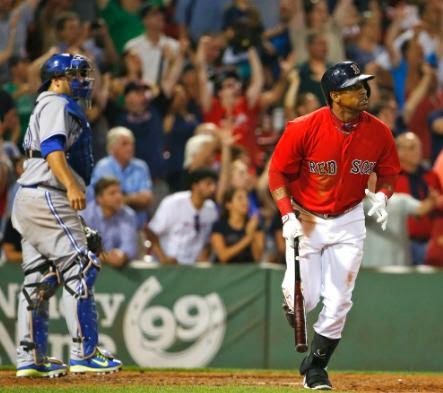 After Toronto came back with two runs in the top of the tenth inning, the Red Sox went to work. Betts, Bogaerts and Vazquez singled to load the bases. Will Middlebrooks drove Betts in with a base hit to left, Dustin Pedroia lifted a sacrifice fly to left to tie the game, and one batter later, Cespedes singled to deep center to bring home the winning run. It was a team-leading fourth hit for Cespedes. Tommy Layne was the winning pitcher in relief, one of seven relief pitchers used by Boston following starter Allen Webster.